If you use Word’s button to center text (e.g. the title and copyright page, or “***” separators), you will notice that the centering is not preserved in your RTF version of your ebook. You can create a specific style for centered text. Click the drop-down arrow under Change Styles to open the Styles menu. At the bottom of the Styles menu, click the New Style button. 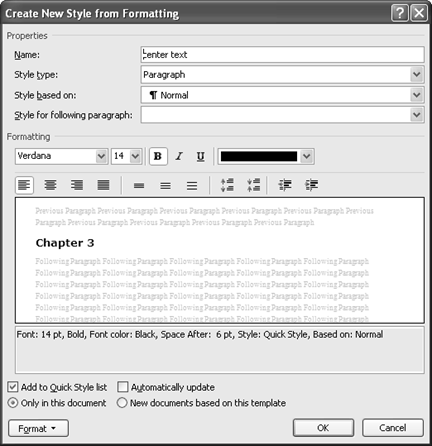 On the Create New Style from Formatting window change the details as detailed below. Type the name of your newly created style, try to make it as descriptive as possible so as not to confuse yourself for future use, e.g. center text. If this style is going to be used as a chapter heading, change the Formatting as needed. As this is a heading style, you should only change the Font, Font Size, and make it Bold. Don’t change the font color. Remember this from the previous post: Your font color should be set to Automatic. If your font color is set to Black, change it to Automatic. Some e-reading devices allow the reader to set their device to night mode, which will display your book’s text as reverse type if it’s set to Black. Click OK to save your new style. Now, when you want text to be centered, you can apply the style you created. As easy and simple as that (or any other style you set), you can just use the style button to apply the changes you need. Italics, underlines, and strikethroughs work well in Smashwords. Some symbols/special characters (such as é î ® © Ω Σ) may translate, but you will need to test your book in EPUB (http://validator.idpf.org/) to ensure they display properly. Rather than using the © symbol, just use the word ‘copyright’, as some e-reading devices and formats will turn these symbols into question marks. As a general practice, avoid using symbols. If you observe what appears to be empty vertical rectangle boxes in your Word file when you have Show/Hide turned on. This often happens when a file is converted from one word processing program to another. Delete them, otherwise these characters may turn into question marks. If you don’t see the screen as shown below, click the Existing File or Web Page button on the left (see screenshot below). In the Address field (at the bottom of the window) add the http:// in front of the URL (see below). If you don’t add this, the link won’t work. You will notice that Word adds the http:// in the Text to display field (at the top). If you don’t want the full URL (with the http:// and the end /) to display in your ebook, delete the http:// and the / in the Text to display field only (e.g. 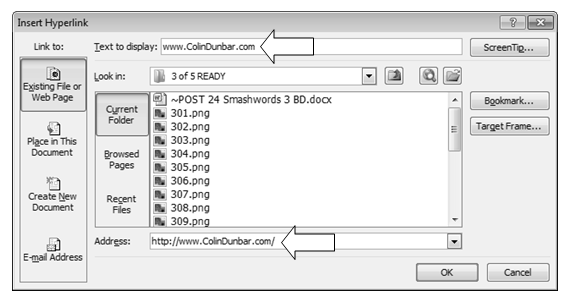 the URL will display as: www.ColinDunbar.com). Or you can type a description for your link, for example the description could be My Personal Website which will then take them to www.colindunbar.com. Click OK to insert your link. 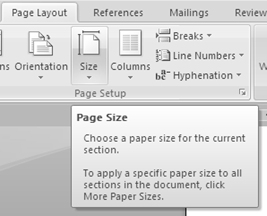 If you insert page breaks into your Word document, the PDF and RTF versions will honor them, but formatting options will be lost in most other file formats (e.g. ePub, Mobipocket, etc. ), which strip page breaks and section breaks. Loss of page breaks is okay in an ebook, because you can’t predict the font size or screen size the reader is using, and you want to have continuous reflowable text. The worst thing that will happen is paragraphs may become artificially close or too separated. Remove all section breaks from your document. They create unnecessary blank space in your ebook. 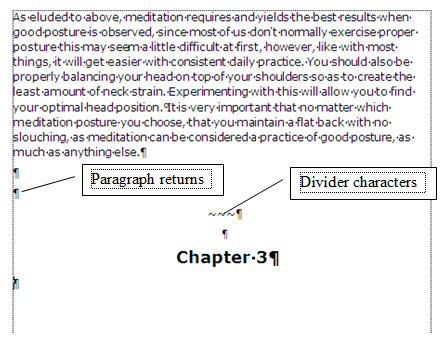 If you want to separate chapters, insert a consistent number of paragraph returns (maybe three or four), or use a combination of two paragraph returns, followed by centered text characters such as ~~~~ or * * * *, followed by a couple more paragraph returns and possibly chapter headings if you have them (see example below). Do not use solid separator bars. A good rule is to never use more than four consecutive paragraph returns to arrange text on the page. NOTE: Many ebook reading devices such as the Kindle and iPad will add extra padding after each paragraph return, so if you add multiple paragraph returns this can create excessive spacing between paragraphs. If you have graphic images in your book, and the images are critical to your book, when you publish your book at Smashwords, uncheck the checkbox ebook option for “Plain Text” because graphic images don’t translate into plain text. If the images are a nice-to-have but not a need-to-have, then go ahead and allow the Plain Text option. You can insert .JPEG or .PNG images. Smash words recommends PNG’s for all images. The Smashwords file Upload Limit is 5Mb. The source .doc file you upload must be less than 5 megabytes in size. 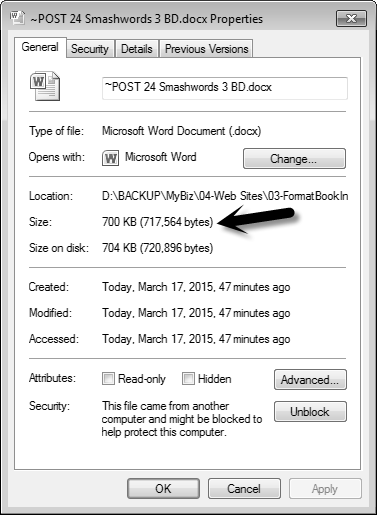 To determine your file size, right-click on your Word .doc file in Windows Explorer and click properties. 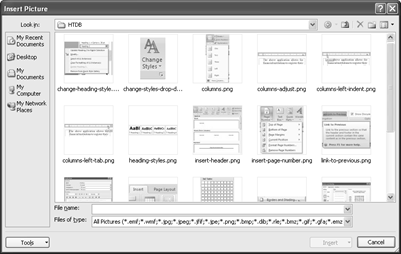 The file size will display on the General tab. NOTE: In Word 2010, when you add a picture to the file, it is automatically compressed using the number specified under Image Size and Quality on the Advanced tab of the Options command. By default this is set for print (220 ppi), but you can change this option. IMPORTANT! This setting applies only to pictures in the current file or the file selected in the list next to Image Size and Quality. Under Image Size and Quality, click the file that you want to set the default picture resolution for. In the Set default target output to list, click the resolution that you want. NOTE: Screen resolution is suitable at 72 dpi. Click your pointer at the place where you want the graphic image, e.g. 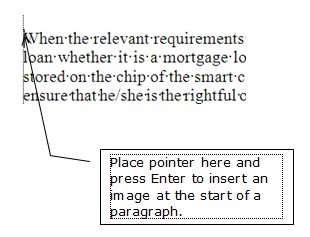 if you want to place an image at the start of a paragraph, click your pointer at the start of the paragraph (see below). Navigate to the folder where your graphic images are on your hard drive. Click the image you want to place in your ebook. The image will be placed where your pointer is. NOTE: Keep in mind that the page size is not relevant when your ebook is viewed on an e-reader. Try to format your book to adhere to Word’s standard margins for printing, otherwise your PDF and RTF files won’t print well or present well on screen. Click the Page Layout tab on the menu bar, then click and open the Size option. On the drop-down menu, choose either Letter or A4. The Paper option should be displaying, and if not, click the Paper tab. 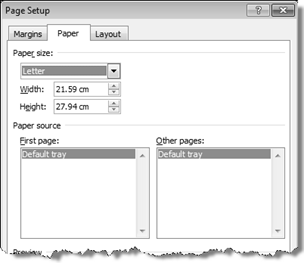 Open the Paper Size drop-down menu, and choose your paper size. Check that the Apply to drop-down menu is set to Whole document. Unlike designing a hard copy book it’s not necessary to set up your Smashwords ebook with different odd and even pages. Header and Footer (from edge). It is not necessary to change these settings, as headers and footers are not used in ebooks. No need to change the Vertical alignment setting at this stage. Leave the Apply to setting as it is at this stage. No need to use Line numbers – these are usually used in legal documents, or academic papers. You can leave the default margin dimensions as is. In the next post we’re going to look at adding a Table of Contents.